Now the web is over ten years old. That customer base has become comfortable shopping online. 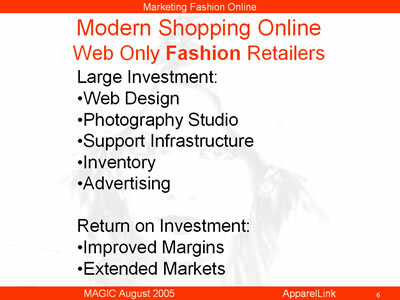 Today there are companies whose business model is to market fashion only via the web. They have learned from the traditional marketers and have “leap-frogged” over the older established businesses to focus solely on the online customer. They have large investments in web design, photography studios, support infrastructure and inventory but in return have the improved margins and extended markets that the web provides.